�Da Site Is Getting Betta!!! Pokemon Dome is getting better and better. We have been in the two hundreds in Pokemon Village Topsites for two days. That means we are getting around seventy visitors a day. The new layout is done, and almost 50% of the stuff is up in the new server. Well, that's all for now. Hey all! If you took a picture of me right now, what you'll see is a big smile. Pokemon Dome's hits has grown tremendously!!! But, the new layout isn't so good. It's very difficult to make. Make that impossible. And I still have a whole lotta stuff to upload to the new server. But for sure, the new site, this time I won't change the name, will be up by the end of January. Sorry for not saying Merry Christmas. But Happy New Year, well, soon. Visit everyday! I have quite a few big plans for Pokemon Dome. If you guys can come here everyday and get Pokemon Dome to the 200's in Pokemon Village Topsites, I might buy a domain. Right now I'm just uploading the stuff from our current server to the new server. As I said before, Pokemon Dome will be moving. When everything's uploaded and the new layout is up, I will post the link to the site. Everything will be changed. Layout, format, everything except for the content. So be sure to come here often, then we can get a domain. Merry Christmas to all visitors! Do you know how hard it is to find news? I couldn't find any! So Merry Christmas! Greetings!!! I am sorry for not updating for a long, long time. But still, Pokemon Dome got more visitors. Well, looks like we have the bad luck of moving to someplace else again. Hypermart only hosts business sites, and this isn't business!!! So, sorry fans, we might have to move. The contest is going great!!! Currently, my affiliate, the webmaster of G/S Poke Center is winning. I'm deciding to choose the second place randomly. So if you want the second place place prize, the topsites and hosting script, then all ya have to do is just send one e-mail. But believe me, the first prize is much better. As you may know, Neo Genisis came out (while Japanese kids are opening Neo 3 cards). Quite a lot of news, but I don't have time to mess around with them. DetDragon is gone, not for good, but gone for now. Snowyblaster will be fired too if he keeps up the "no updating" stuff. And right now, I'm firing Pyro. Hey, all webmasters!!!! Want good stuff for your site? Now you can have it all. I got a contest up, and I guess most of you know about it already. Well, to make it clear for people who don't know, look below. Just come to Pokemon Dome every and type your e-mail address into this box, and you can win one of different webmaster tools. Read more about it by CLICKING HERE. Enter Your E-mail Address Now!!! I just got something up. It's called Webmaster's Guide. If you would like to create a webpage of your own, you can go there. Click Here to go there. Unfortunately, the HTML Help will take quite a long time to finish, since I have quite a lot of things to do. Probably not much stuff will be done these days, since I have a football report and a volcano project. But soon, it will be winter break, and I'll be updating the site even more! That's all. Staff, please post news!!! Well, after one of my affiliates helped me with the new message board, I'm proud to say that it is up!!! It's not 100% done, since I still need to work on some pictures in there. To make it clear to everyone, I'm going to make a big link below so you'll know to click there to go to the message board. Okay, here goes. I've just updated the Crystal Review. CLICK HERE to read the review. The Pokemon Crystal Screenshots are also up. So click here to view the screenshots. Celebrate the start of the second year of the Pokemon TCG League by entering the "Birthday Pikachu Quiz Contest!" Click Here to go to the contest page at the Wizards of the Coast website, answer five questions, and you will be given an entry form to enter your name in the contest for a free "Birthday Pikachu" card. If you go to the Pokemon TCG League often, you'll get all the answers. I tried it, and it was easy. No matter how many questions you get wrong, you'll still be able to enter. It looks like Pokemon Dome is getting more and more visitors, and we just got a super cool affiliate, Project Poke 2k. This is the best affiliate Pokemon Dome has had till now, since they get tons of hits :). Click here to go there. Well, I got this news, which is old, but I posted it anyway. Again, I got this from my new affiliate, Magikarp's Secret Society. It's a cool website, so please go there. Below is the summary for the movie, Celebi A Timeless Encounter. In a forest there is a Pokemon known as Celebi. A young boy goes into the woods to find a young girl who has found a mysterious Pokemon. Somehow Celebi is endangered and flung 40 years into the future with the boy. Here they meet a 40 years older Ash and a (really) old Pikachu. Ash makes friends with the boy and they discover of this new Pokemon. However, a new enemy is in the mix and he wants to capture Celebi. Ash and the boy together protect the Celebi from this new enemy. So, what do you all think of the new layout? Rockin' cool, or flaming hot? Or just too hard to see? I changed a few things in the new layout, as you can probably see. I did get the comment thingy up yesterday morning, but I don't feel like having it anymore. Thus, I removed it. As you probably have noticed, the polls aren't working anymore, so I'll have to get a poll from somewhere else. And these days, I've been getting more and more visitors, just like before!!! That's all for now. Just a few more minutes until "Pokemon Johto". Yeah! And I hope it's all new! changed release date for Neo Genises, it will be released in mid-DECEMBER, prolly da 15th (there goes that slang again) , i wont be lookin forward to it, but you prolly will, so Happy Hunting! btw, i think yall should send Mewtwo a nice PKMN card, where u ask? on this very website! dont you people read the updates?!?!?! Well, the pokedex is officially opened, at last! It has pictures and information on all 151 Pokemon, and I'm going to be adding Gold/Silver Pokemon into there. But I currently can only get some pictures of them, since I don't know much about them. CLICK HERE to go to the pokedex! What am I doing right now, you ask. Well, I'm trying to get this thing to put comments on the news up. It seems pretty hard, but I'm sure I'll get it up soon. Also, the games section is all up. Except when you click on "Info" on any one of those, it would look very odd. The new games design is for the new layout, which hopefully will be up in a few days. Hey, look what I found! Pokemon Crystal's box!!! It looks pretty cool, I think it's the best Nintendo has ever made on a Pokemon game. 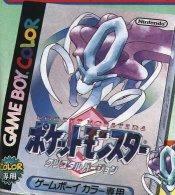 I'll be trying to get more information on Pokemon Crystal. Sorry, all, for updating so late. I had to take a shot in the morning, so that's what delayed me. Oh, ya, please don't join the current bulliten board, since I'm trying to set up a new one. Also, I've got some really bad news. Alexx lost the Gold/Silver walkthrough, and he won't make another one. That means Pokemon Dome'll have to live without one. I'm not really happy these days. One reason is that my staff aren't even updating. If Articuno don't update by the next week, his account will be removed. I'm going to make a new layout since this layout looks kinda dull. The new layout will still be layout version 2.0 since this current layout isn't really what I wanted. As you can see, I changed the images for the news. Oh, yeah, all the games info (such as Gold/Silver, Red/Blue), will be down for a few days. I will be changing some stuff in there that goes with the new layout. That's all for now. Wanna send a message to your best friend. Wanna say "HAPPY BIRTHDAY"? Now you could through Pokemon Dome's brand new feature (which took me hours to set up), drum-roll please......Pokemon Postcards!!! Now how about that? Wanna go now to send a postcard to someone, or just take a look? Sure, it's all up and running smoothly. Just click here. If you discover any flaws, bugs, or errors, please report them to me immediately. I check my e-mail everyday. GUESS WHAT? The Neo Genisis 111 card expansion will be released in January 15th, 2001. Hopefully, the people here where I live will get into Pokemon because of the release of this cool set. There will be three different Neo Sets to be released, and the first one is called Genisis. It will contain all of the new Pokemon from Pokemon Gold/Silver along with new energy cards, Darkness and Metal. At a press conference in Tokyo, a group of celebrities showed up to promote two new Pok�mon movies. The films, Celebi: Toki wo Koeta Sogu and Pikachu no Doki-Doki Hide-and-Seek, are set for simultaneous release, and represent yet another wave of Pok�mania just around the corner. The press conference featured appearances by Kunihiko Yuyama, director of Celebi, and Shiro Sano, voice for Team Rocket's Vicious(Celebi's villain). Also appearing at the conference were Kumiko Endo and Anne Suzuki, two popular Japanese celebrities, who are, respectively, the narrator to Pikachu Hide-and-Seek and the voice of nurse Miku. The four, seated on a stage decorated in a forest theme mirroring the movie's setting in the Pok�mon forest, fielded questions about the movie and offered their perspective on being in the cast. Each of the actors was very enthusiastic about the movie and their roles; Ms. Suzuki "felt like she was dreaming" to be cast in the role, her first as a voice actress, and Ms. Endo was similarly enthusiastic, saying she "was going to enjoy being surrounded by Pok�mon". Mr. Sano, for his part, was also looking forward to the experience; however, his daughter was unimpressed with the fact her father was going to be in the movie, saying "So? You'll just be a bad guy anyway." Pikachu no Doki-Doki Hide-and-Seek and Celebi: Toki wo Koeta Sogu are scheduled for release across Japan on July 7th, 2001. It is not known at this time whether the movies will reach North America, but given the success of previous releases, there is at least a reasonable chance. Now that that is finished, time for some update reports. Well, just wantd all of you to know, the Pokedex already have information on the first 114 Pokemon, and is going up every day. There are currently no pictures in the Pokedex, but I will be adding them soon. After watching an episode of Pokemon yesterday, I heard some jokes from Meowth, and decided to open the Pokemon Jokes section. Please go there by clicking on that link. I've just noticed that my affiliate, Pokemon Dungeon 2000, has a new and cool layout. Please go there by clicking here. Hey, all you Poke-maniacs who visit my page! I welcome all of you to a new month, and there are many new things I would like to tell you today. Well, the pokedex isn't exactly up, and this pokedex isn't exactly what I thought it would turn out to be. A few weeks ago, I was creating this pokedex, note that it is plain text and pictures. But a few days ago, I discovered the pokedex by Alan Shepherd, the best pokedex online!!! So I decided to use it, and kind of modify it. I'm going to add Gold/Silver pokemon info in there, but that'll take a while. All the pokedex have now is just information on the first 68 pokemon, but it's growing everyday. So come to the pokedex often. Click here to go to the new pokedex. I've got a new poll up, so please vote there. You can find it on your right. Ash, of cource, is the winner of the last poll. Brock came out second, but Tracy came out third? I thought most people didn't like him! Okay, there is a new battle in the arena, and a new poll in there so you can vote forwho will win the next battle. This month's battle is Onix vs. Pikachu. Go there by clicking here. The new affiliate is called Pokemon Paradise. You can check out that website by clicking on the name. Well, that's all the news for today. That's a looooooooot of news!!! So come back everyday for even more news!! !